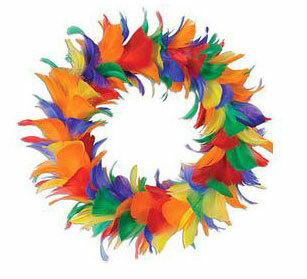 Decorate for your Carnival with the Rainbow Feather Wreath. You can hang this bright wreath on a door, a wall, or use it as a centerpiece. The Rainbow Feather Wreath has rainbow feathers surrounding it. Each wreath is sold 1 per package.